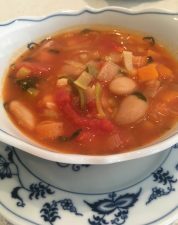 This soup is a cross between a Minestrone and Pistou vegetable soup but contains less fat and salt and more protein and dietary fibre. If you are keen to reduce the sodium levels still further then simply replace the canned tomatoes for raw and the canned beans for dried, cooked beans. Heat the olive oil in a large saucepan. Add the leek, carrot and garlic and cook for about 5 minutes until they have softened. Stir in the tomatoes and stock. Bring to the boil, then cover and cook for 12-15minutes. Heat through for a further 5 minutes. Serve in heated bowls, sprinkle with parmesan cheese and serve with warm whole grain bread rolls. If you need to reduce the sodium level still further then swap the canned tomatoes for raw and buy dried beans and soak overnight, drain then add fresh water and cook without salt until the beans are tender.